Foreword (T. Schneider). I. Opening Session. Opening address (P. Winsemius). Statement (K.A. Sahlgren). II. Effects in the Environment. Acidification effects in the aquatic environment (W. Dickson). Effects of acidification on forests and natural vegetation, wild animals and insects (B.A. Molski, W. Dmuchowski). The impact of ozone on agriculture and its consequences (D.T. Tingey). Effects of acidic deposition on soil and groundwater (J.J.M. van Grinsven et al.). Effects of acidification on materials and cultural property (N.S. Baer). Ecological horizon (Yu.A. Izrael, S.M. Semenov). The economic impact of acidification (L. Bergman). III. Forest Dieback: The Potential Stress Factors. Characteristics of trees predisposed to die (R.H. Waring). Stress factors: trends and recovery (H.C. Martin, T.G. Brydges). Atmospheric acid deposition: effects on the chemistry of forest soils (N. van Breemen, J. Mulder). Atmospheric deposition: impact via soil biology (S. Hågvar). Air quality: direct effects of SO2 and NOx (J. Materna). Studies on Norway Spruce (Picea Abies Karst.) in damaged forest stands and in climatic chambers experiments (K. Vogels et al.). IV. Effects on Materials and Cultural Property. Deterioration processes of historical monuments (D. Camuffo). Effects of acidification on artifacts in archives and museums (N.S. Baer). Effects of acid deposition on construction materials (J.C.Th. Hollander, R.W. Lanting). Acidification and drinking water - groundwater (U. von Brömssen). V. Models as Tools for Abatement Strategies. Models as tools for abatement strategies: air quality management approach (M.L. Williams). Trajectory models of the long-range air pollutant transmission (A.J. Pressman et al.). Acid rain abatement strategies in Europe (L. Hordijk). Effectivity of abatement strategies: PHOXA (C. Ludwig et al.). General survey of effects (D.J. Kuenen). VI. National Research Programmes and Policies Regarding Acidification. Official report of the conference. National presentations. VII. Closing Session. Final remarks (P. Winsemius). Subject Index. 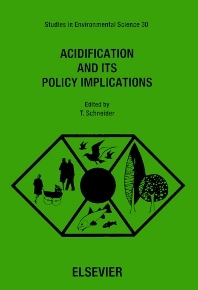 Providing a wealth of reference material for research scientists and policy makers, these proceedings address the extremely complex problem of acidification - a phenomenon which is causing serious deterioration of natural environments in Europe and North America. Papers review the effects of acidification on the aquatic environment, flora, fauna and vegetation, and materials, and also review cultural properties, the ecology as a whole and the economic impact of acidification. The papers on forest-dieback cover potential stress factors and the effects on materials and cultural properties. Scientific research results are presented which deal with models as tools for abatement strategies, and underline the application of models in policy-making. The review papers of scientific research on acidification are followed by the official report of the conference, and presentations by representatives of the EEC member countries giving an overview of national research programmes and policies regarding acidification.